The Stampin' Bean: Butterflies & Blooms! Happy April, crafty friends! Today I get to share two pretty projects that I created for the April Release at Taylored Expressions. I'm excited to share them with you because they were so fun to create. 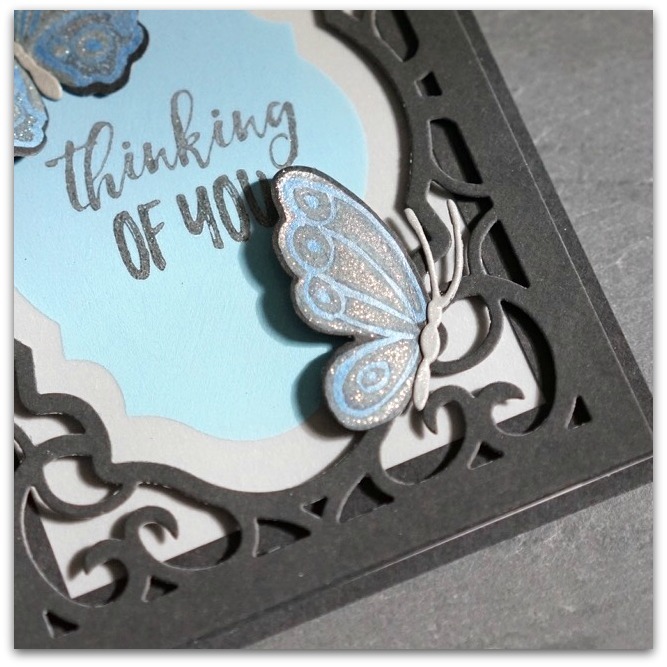 The first project is this elegant card I made using the new Simply Stamped - Butterflies. I tried out the new Tim Holtz Distress Oxide ink on Oreo card stock and I thought the results were very nice -- inking on dark card stock is a challenge and these were fun to use. 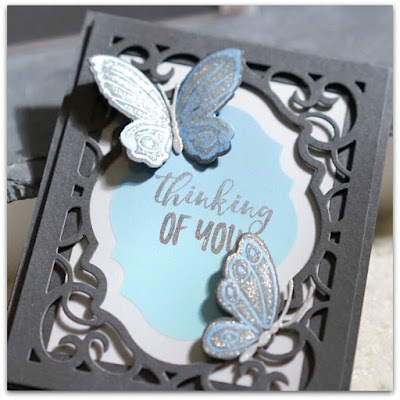 I added sparkle and shimmer with some Wink of Stella and Wink of Luna pens before die-cutting the butterflies out with the handy dies that coordinate. I carefully outlined using the pens. The shimmer is really lovely. 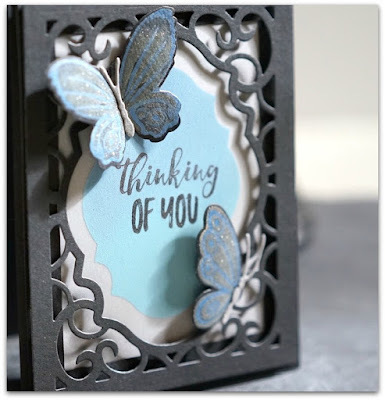 I used the Ornate Frame Cutting Plate to frame up my card. I don't usually make black cards, so this was a little outside the comfort zone for me. I added some color by sponging more distress ink using one of the included frames in the Cutting Plate as a mask on vellum. I love how it looks on the Heavyweight Vellum! 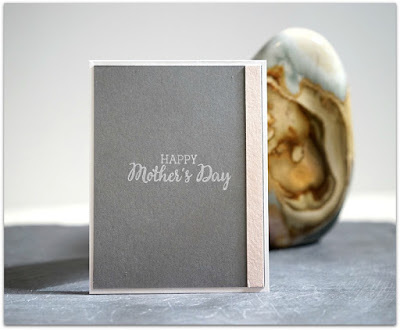 Next is a Mother's Day card I made with the new Block Party Mom die. 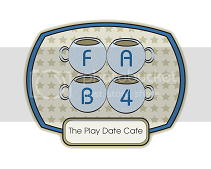 It's a cool die because you can move it anywhere you want on your card. Here, I also used the new Quatrefoil Embossing Folder to add some pretty texture. I used some TE Wool Felt in new heather colors, which I thought was brought out by the Earl Gray strips of card stock I added to the top and bottom of the "Mom". These were cut out using the new Mini Bloomers 2 die set. I topped each off with an Enamel Shape in Sugar Cube. Super sweet! 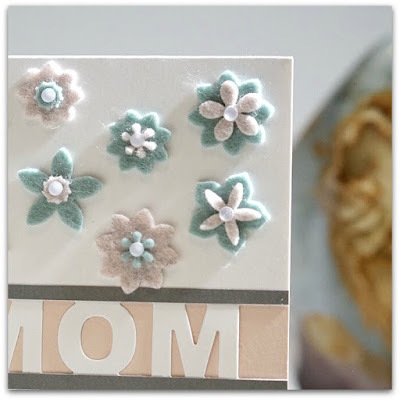 And for the inside, I used the new sentiment set, Simply Said Mom. It was the perfect, simple way to finish off the card. I hope you enjoyed my projects today! Be sure to visit the TE Blog today for more projects from their amazing design team!